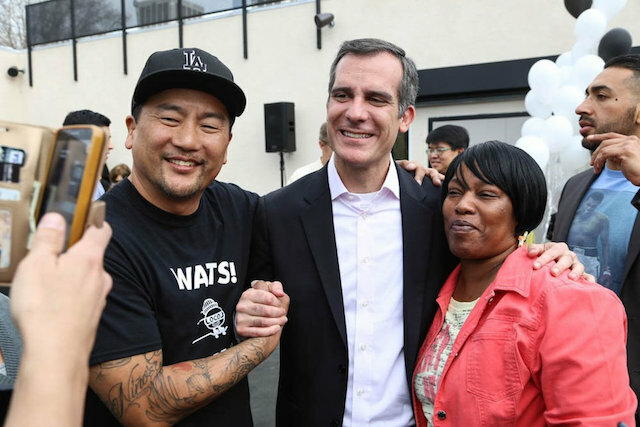 Socially-conscious restauranteur Roy Choi opened the first brick-and-mortar outpost of his "revolutionary fast food" chain LocoL, which focuses of bringing affordable and healthy fast food to underserved neighborhoods, in Watts this January. Now, it looks like Choi will soon be bringing the bounty of LocoL to the streets, with a LocoL food truck slated for operation this fall. "Say hello to the #LocoL low rider," Choi wrote in an Instagram post Thursday, sharing a photo of a beat-up looking food truck, which he promised would be ready to serve in September. The addition of a LocoL food truck certainly takes things full circle for Choi, who (long before his restaurant and hotel empire) first made his name with his wildly popular Kogi BBQ truck.